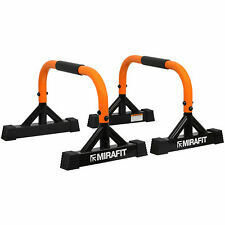 Mirafit mini Parallettes. Depth: 60cm. Total height: 36cm. Quick and easy to assemble. Mirafit Multi Grip Landmine Handle. Multiple grip positions allow you to target specific areas and precision train. Slides securely onto the sleeves of both 2" Olympic and 1" standard barbells. Mirafit Olympic Black Shrug Bar. Includes 2 quick release snap collars. For use with Olympic 2" weights. Centre length: 68cm. Heavy duty steel bar. Bar ends: 24.5cm. Built in stand allows for quick & easy pick up. Knurled grip handles. Grip length: 12.5cm. Simply slide onto weight bar and load plates on top. It is adjustable for a custom fit and features padded neck and arm rests. Curl bar and weights not included. Enforces proper positioning during bicep workouts. Comfortable padded neck and arm rests. Hardcastle Bodybuilding Squat Rack With Dip Bars. Can be used with 1" & 2" Olympic barbell bars. Adjustable width, rack height & spotter height for enhanced workout ranges. Rack height: 93cm - 151cm. Max load: 250kg. Mirafit Viking Landmine Press. Net weight: 8.4kg. Simply slide over bar sleeve and secure with the threaded stop pin. Suitable for a wide range of exercises. Develop rotational and core strength. Can be used both with and without weight plates. Mirafit T Bar Row Landmine. 10" Olympic bar sleeve. 360 ° swivel platform. Fits into corner of room - no need to bolt into ground. 6" standard bar sleeve. Handy carry handle allows for easy transportation to desired workout locations. DTX Fitness Adjustable Hyper Extension Bench. Set at 45 degree angle for optimum workout. Includes handles for stability and to vary workout difficulty. Strengthen your back muscles safely & comfortably. Note: this extension is not suitable for use with the Mirafit Mini parallettes. Mirafit Adjustable Width Bar Extension. Compatible with Mirafit 90cm parallel dip bars. Dip bars not included - this is for the adjustable width bar extension only. Hardcastle Bodybuilding 4ft Olympic Barbell Weight Bar. Suitable for all Olympic 2” weight discs. 83.5cm centre section. 16cm bar ends. Bar weight approx. Includes 2 quick release spring collars. Pre-drilled holes in the base plate also make this landmine suitable for bolting to the floor (fixings not included). 360° swivel platform. When fitting to a door you must ensure you check the door is solid and strong enough to withstand the use prior to installation. Made from strong high tensile steel, the grippers are highly durable whilst the soft foam handles ensure maximum comfort and an anti-slip grip. Sold as a pair, they can also be used for rehabilitation or physiotherapy exercises after a hand injury. Universal T-Bar Row Platform – 360° Swivel Landmine For All Bars from 1" to 2"
Creates a quick, versatile landmine setup with only two weight plates. Suitable for most 2"/50mm Olympic barbells. Strong steel construction with black powder coated finish. 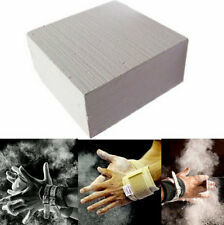 1 x Gym Chalk Magnesium Carbonate For Sports Gymnastic. 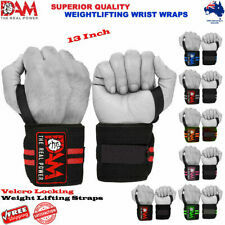 It is excellent for making your hands dry for weight lifting sessions, power-lifting, rock-climbing, cross-fit training, and so on. 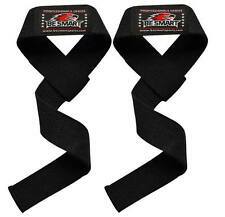 Moreover, it can provide better grip over barbell, dumbbells and slippery surfaces. 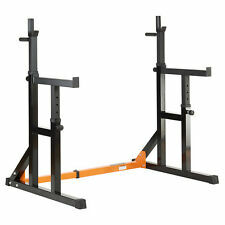 DTX Fitness Adjustable Squat Stands With Spotters. Rack height & spotter height fully adjustable. rack height: 87 -157.5cm. overall height: 99- 169cm. Mirafit Lat Blaster Bar. Ideal for use with our Mirafit t bar row platform. Removable centre Olympic bar adaptor. Rubber handles for improved grip. Handle length: 19cm. Length: 87.5cm. FREE Delivery & Exercise Guide Included! 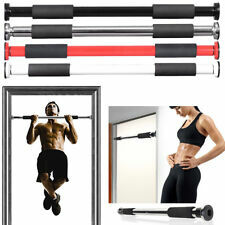 Mirafit 34" Multi Grip Pull Bar. Ideal for lat pull downs, rows, push downs and more. Grip length: 11cm. Compatible with most cable machines and multi gyms. This is the athletes edition but includes the beast vest and the rack mount for your smart phone. Now you can stop relying only on feelings and sensations to evaluate your workout quality: Beast Sensor is the perfect tool to start quantifying your performance when lifting weights. 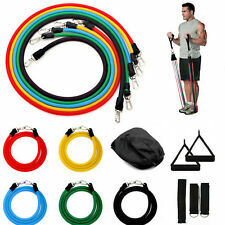 TRX Club Pro 4 Suspension Training Kit (Official TRX Brand New). Condition is New. Not needed, spare gym stock as one too many was ordered. Bought for £189 Very durable hard wearing commercial grade TRX new club pro 4 addition.